At some point today, likely this morning in Tampa, Dellin Betances was scheduled to throw a simulated game. It is his second time facing hitters since being shut down with shoulder inflammation on March 19th, and, if all went well, it is reasonable to think he could begin a minor league rehab stint shortly. “We feel like he is making progress,” Aaron Boone said earlier this week. The bullpen without Betances has yet to live up to its Super Bullpen billing. Adam Ottavino has been excellent, and Luis Cessa as been quietly solid in low-leverage mop-up innings, otherwise the bullpen owns a collective 3.97 ERA (3.28 FIP) through 12 games. The group’s 24.6% strikeout rate is a good five or six (or more) percentage points below the expectation coming into the season. Zack Britton is laboring. More baserunners (12) than swings and misses (10) is impressively bad. Chad Green has a 55.6% hard-hit rate and has struck out one of the last 19 batters he’s faced. Aroldis Chapman is missing velocity and has been quite hittable in the early going. Tommy Kahnle has regained some velocity but he’s not back to his 2017 form. Ottavino is on pace to appear in 81 games and warm up in 14 others. The starting pitchers haven’t helped matters and the Yankees definitely need those guys to start pitching more effectively and pitching more in general. The four non-Masahiro Tanaka starters are averaging 4.1 innings per start in the early going. That can’t continue. The relievers can’t pick up that many innings each game. Anyway, getting Betances back would not help Britton throw strikes or Green miss barrels. It would lessen the team’s reliance on them, however, at least to some degree. Dellin reclaiming the eighth inning frees up Ottavino for higher leverage work earlier in the game, and remember, the Yankees just lost two games in Houston because seventh inning leads were blown with Not Ottavino on the mound. There are two questions with Betances. One, when is he coming back? It’s impossible to say right now. Even if today’s simulated game went well — today’s an off-day, so we won’t get a Dellin update until tomorrow — returning for next week’s Red Sox series is unlikely. Could he be back for the start of the West Coast trip on April 22nd? That would seem to give him enough time for three minor league rehab appearances. Maybe four. 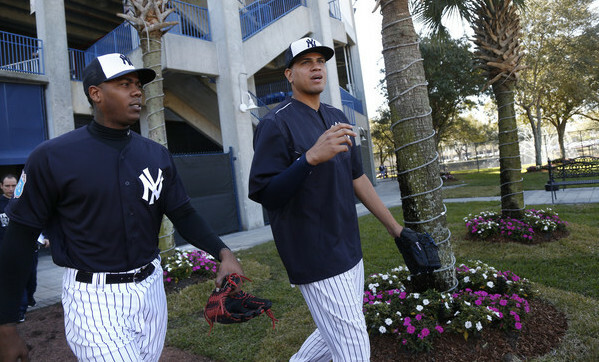 And two, how effective will Betances be once he returns? Sometimes shoulder inflammation is truly nothing and the guy comes back with no ill-effects. And sometimes it lingers all season and the pitcher is never quite right. Betances coming back as something less than the high-leverage monster he’s been throughout his career would be bad news for the Yankees. Real bad news given the state of some of the other relievers in the bullpen. 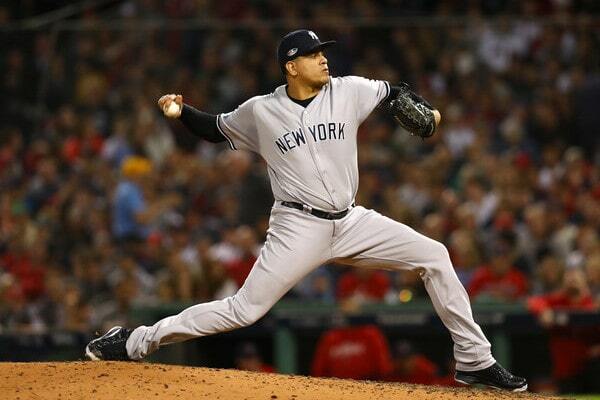 Knowing the Yankees, they’ll ease Betances into things once he returns. Two or three lower leverage spots just to get his feet wet before thrusting him into big situations. I have no problem with that. A healthy and effective Betances allows the Yankees to use Ottavino earlier in the game, and also shelter Britton and Green until they turn things around. Of course, they might’ve already turned things around by time Dellin returns, but I digress. The bullpen has not only not performed as expected thus far, it is actively hurting the Yankees. Betances is one man and he alone can not fix things. The Yankees need Britton and Green to right the ship as well, but a healthy Dellin would have helped these last 12 games, and there’s an obvious need for him going forward. Clearly, there is no such thing as too many good relievers. The sooner Betances comes back and is effective, the better the Yankees will be. The Yankees were arguably the most active team in baseball this offseason and, for a little while there in January, they made a free agent signing a week. Troy Tulowitzki one week, Zack Britton the next week, DJ LeMahieu the week after that, then Adam Ottavino the week after that. Then they capped it all off by trading Sonny Gray. Those few weeks were quite busy, and buried in all that activity was a minor league signing that represented so much more. The Yankees inked journeyman righty Danny Farquhar to a minor league contract on January 21st, eleven months after he collapsed in the dugout while with the White Sox. He suffered a life-threatening brain hemorrhage after an aneurysm ruptured. Farquhar spent three weeks in the hospital after collapsing in the dugout and he’s said he felt he could’ve returned to the mound last September, but decided not to push it. He took it slow during the offseason and eventually the Yankees scooped him up as a depth piece, and they had a protective liner custom made to fit under his cap. Watch the video of his press conference and scroll through his Instagram feed and you see someone who is so very clearly overjoyed to be playing baseball again. Farquhar’s still a young man, he turned only 32 this past weekend, and he has a wife and three young children. He nearly lost his life last year and now he’s back at the park, doing what he loves. It is impossible not to root for this guy. Does Farquhar have a chance to crack this bullpen? Yes, he does. I wouldn’t call it likely but he does because there are two open bullpen spots. Farquhar says he’s trying not thinking about that — “I’m happy to be in a uniform and playing. I try not to look at the big picture too much because then you get overwhelmed and caught up in stuff,” he said — but gosh, it has to be in the back of his mind, no? It’s only natural. Obviously Farquhar’s performance in camp will be the biggest factor in determining whether he gets a bullpen spot. The arm strength is looking good but we have to see how he fares against hitters — “Hitters will always let you know what your stuff is. I’m curious to have that feedback,” he said — because, at the end of the day, this is a guy who hasn’t pitched competitively since April. There’s bound to be some rust. There are a few things beyond spring performance that Farquhar has going for him. First of all, he has a history with the organization. The Yankees liked Farquhar enough that they claimed him off waivers in June 2012 — Farquhar said he and Dellin Betances were roommates with Double-A Trenton — and while they traded him for Ichiro Suzuki a month later, that was business. The MLB roster takes priority over a Double-A bullpen prospect. Secondly, Farquhar is a strikeout pitcher and the Yankees love strikeouts. He’s thrown at least 30 innings in five different MLB seasons and in three of those five he posted a 27.0% strikeout rate or better. (His career strikeout rate is 26.9%.) Relatedly, Farquhar is an analytics guy. He told James Fegan (subs. req’d) the Rays got him into numbers during his time with Tampa and he’s kinda run with it. Not coincidentally, Farquhar is a spin rate guy and the Yankees love pitchers who can spin the ball. Over the last two years his low-to-mid-90s four-seamer averaged 2,372 rpm, better than the 2,263 rpm league average. Add in his reputation for being a good clubhouse guy — “He’s already brought something to us just from the energy he brings to the park every day,” said Aaron Boone to Dan Martin — and Farquhar has some things going for him. Of course, we are talking about a pitcher who was just okay (4.20 ERA and 4.07 FIP) in his most recent full MLB season, and a guy returning from a serious medical condition. The bullpen sessions look good but those are only bullpen sessions. Once Grapefruit League games begin this weekend, it could become clear quickly that Farquhar is rusty and will need Triple-A time before he’s ready to contribute to a big league roster. Don’t mistake this for a charity minor league signing. Farquhar’s been a full-time big leaguer since 2013 and he’s pitched in high-leverage situations, most notably saving 16 games for the 2013 Mariners and setting up for the 2016-17 Rays. The strikeouts, spin rates, and analytic slant are all things the Yankees value. This is the second time they’ve acquired him, remember. He’s been on their radar for a while. The Yankees signed Farquhar because they believe he could help them win games at some point. If not right away in one of those final two bullpen spots, then later in the season, once he gets his bearings in Triple-A. No matter what happens on the field, Farquhar is a feel-good story and someone worth rooting for. This is the best kind of comeback story. The Yankees reportedly hope to add two relievers between now and Opening Day. Two relievers to replace David Robertson and Zach Britton, and hey, it is entirely possible they will re-sign Robertson and/or Britton. Even with Aroldis Chapman, Dellin Betances, Chad Green, and Jonathan Holder in tow, there’s still room for more quality relievers in the bullpen. Always and forever. Among the in-house bullpen candidates is Tommy Kahnle, who the Yankees acquired prior to the 2017 trade deadline for two reasons. One, to help their 2017 postseason push. That big trade with the White Sox was a watershed moment. The Yankees went into the day of the trade having lost 21 of their last 30 games (for real). The front office said forget about that. We’re getting you guys the help you need and we’re going for it.
? … and there was reason to believe Kahnle would again be a key contributor in 2018. It didn’t happen. He struggled early, got hurt, then was sent to Triple-A. He threw 23.1 innings with a 6.56 ERA (4.19 FIP), and while his strikeout rate (28.0%) was good, his walk rate was not (14.0%). Kahnle also had a 4.01 ERA (2.85 FIP) with 34.6% strikeouts and 10.3% walks in 24.2 innings in Triple-A. He was bad. Real bad. Even if the Yankees add two relievers before the start of the regular season, there are still open bullpen spots to be had, and it stands to reason Kahnle will have a chance to win one of them in Spring Training. He is out of minor league options, so he can’t go back to Triple-A, but I don’t think that’ll guarantee him a roster spot. The Yankees will take the best arms regardless of roster status. Three things about Kahnle keep crossing my mind. … and I think at least part of his control issues stemmed from Kahnle muscling up and throwing max effort to generate velocity. His average fastball checked in at 98.11 mph in 2017. In 2018, he topped out at 97.96 mph. Kahnle’s shoulder was compromised and it showed in his velocity, and maybe in his control as well. With any luck, an offseason of rest will get Kahnle’s shoulder right — “Not being on the playoff roster kind of gave me a head start on that. So I got the extra two weeks,” he said — and allow him to again generate that upper-90s velocity we saw in 2017. Kahnle is only 29 years old. He’s not at that point where you’d normally expect age-related decline. A proper offseason will hopefully get him back to where he needs to be. 2. His spin rates are okay. For what it’s worth, Kahnle was still able to spin his fastball and changeup last season. The velocity wasn’t there, but the spin was, and that’s not nothing. Even in 2017, he had an average fastball spin rate and that was true again last season. His changeup spin rate was actually one of the lowest in baseball at 1,391 rpm last year and that’s a good thing. You want low spin on a changeup. It creates that tumble down and out of the zone. Why is this important? Because we’re looking for signs of 2017 Tommy Kahnle. Had his fastball lost spin while his changeup gained spin, thus blending the two pitches more closely together, it would’ve been a significant red flag. Velocity and spin rate declines are very scary. Losing one or the other is still scary, but not as scary as losing both, and theoretically an indication things could be fixed going forward. A little more arm strength could have Kahnle right back to where he was a year ago. 3. The Yankees must think he’s salvageable. Otherwise they would’ve non-tendered him last month. A non-tender would’ve been a clean break. Kahnle’s projected $1.5M salary is nothing, so perhaps that saved his roster spot, but the Yankees did non-tender pre-arbitration Alfredo Aceves back in the day. They were so unconvinced Aceves’ back would hold up that they cut him loose. The Yankees could’ve done the same with Kahnle and didn’t. Remember, the Yankees have a bit of a 40-man roster crunch this offseason, and every dollar matters in this luxury tax era. Cutting Kahnle would’ve cleared a roster spot and saved some cash. Instead, the Yankees at least indicated a willingness to carry him into Spring Training — they could still designate Kahnle for assignment at some point this offseason, of course — which is telling. They think there’s something here to reclaim. Each offseason teams (and fans, at that) scour the league for reclamation projects and bounceback candidates. Every team wants to acquire someone when their stock is down and help them get back to their peak. The Yankees already have a reclamation project on their roster in Kahnle. No need to make a trade or place a waiver claim or sign a free agent contract. He’s a classic reclamation project, and he’s already a Yankee. My guess is the Yankees intend to give Kahnle a long look in Spring Training — Spring Training is full of lies, but we should know fairly quickly whether Kahnle’s velocity is back once Grapefruit League play begins — to see whether he can get back to his 2017 form, because 2017 Kahnle was really good. The Yankees are nothing if not patient. They stuck with Chasen Shreve longer than they perhaps should’ve, and my hunch is Kahnle will get a long leash as well. The talent to dominate is there and it’s worth seeing if that guy returns in 2019. The offseason is a month old now and for the most part we’ve spent these last few weeks focusing on the rotation. The Yankees came into the winter needing three starters — two, really, since a CC Sabathia reunion was inevitable — and they’ve since added James Paxton. They remain in the mix for guys like Patrick Corbin, J.A. Happ, and Corey Kluber. Another starter is coming at some point. The Yankees also need to find a Didi Gregorius replacement this offseason, and, although it can be easy to overlook, they need some bullpen help as well. They want two relievers, which makes sense because David Robertson and Zach Britton are both free agents, and also because the Yankees value a deep and powerful bullpen. It has been a priority the last few years and understandably so. Abreu and Acevedo are prospects still in need of development, especially Abreu, so I can’t see them being serious bullpen candidates early next season. Adams and Loaisiga are also prospects with development remaining — Loaisiga needs innings more than anything — but I don’t think the Yankees would hesitate to carry either guy in the bullpen if they believe they’re among their best relief options. The out of minor league options guys could all be gone before Spring Training. It’s extremely unlikely, but it is possible. German is the best of the bunch to me. I don’t think that’s enough to guarantee him a spot on the 40-man roster through the rest of the offseason, let along an Opening Day bullpen slot. Up-and-down guys like Harvey and Tarpley are, well, up-and-down guys. Tarpley could carve out a role and stick around, sure. It is hardly a lock though. Also, looking at the incumbent relievers, there are reasons to want that extra depth. Chapman pitched through a knee problem all season. Betances is awesome but that “you don’t know what you’re going to get from one appearance to the next” element still exists. Green wasn’t as good in 2018 as he was in 2017. Holder? Who knows. He was really good this year but I’m not sure he has the stuff to be a truly dominant high-leverage guy. Point is, there are some definite openings in the bullpen right now and it is not a minor consideration. Not given the way baseball is played these days and definitely not with the way the Yankees run their pitching staff. Sabathia doesn’t pitch deep into games often and Paxton tends to miss time each season, for example, which puts that much more strain in the bullpen. The hook is always quick with fill-in starters like Cessa and German. Back in the day teams needed a closer and a setup man, and then they just kinda filled out the bullpen with extra arms. That isn’t the case anymore. The Yankees have four quality holdover relievers, so the makings of a strong bullpen are there, but these days you need that reliable fifth and sixth reliever too. And, ideally, Holder would be the fifth or even the sixth guy in the bullpen, not the fourth. Two setup caliber relievers would be welcome. There is still a lot of offseason to go and the Yankees need another starter as well as a Gregorius replacement, first and foremost. They also need bullpen help and I don’t mean a last guy in the ‘pen type. The Yankees lost two high-end relievers in Robertson and Britton — they could still bring them back, but you know what I mean — and, if they’re not replaced capably, the team’s entire dynamic changes. A strong bullpen isn’t a luxury nowadays. It’s a necessity. What a difference a year makes. Last year around this time Dellin Betances was persona non grata, essentially unusable in the postseason because his control had deteriorated down the stretch. The Yankees had to cover 8.2 innings with their bullpen in the 2017 Wild Card Game and Betances never even warmed up. Chasen Shreve warmed up. Betances did not. This season, after an offseason of trade (and even non-tender) speculation, Betances reemerged as a dominant bullpen arm, throwing 66.2 innings with a 2.70 ERA (2.47 FIP) during the regular season. His 42.3% strikeout rate was a career high. His 9.6% walk rate was far better than last year (16.0%) and below his career average (11.0%). With Aroldis Chapman’s knee having been an issue in the second half, Betances was the team’s best reliever during the regular season. Wild Card Game: Entered with the Yankees up 2-0, runners on first and second with no outs in the fifth inning, and the 2-3-4 hitters due up. ALDS Game Two: Entered with the Yankees up 3-1, bases empty with no outs in the sixth inning, and the 2-3-4 hitters due up.
? Betances has gotten six of the biggest outs of the year so far. That’s not an unreasonable thing to say. The biggest and most impactful out is probably Luis Severino striking out Marcus Semien with the bases loaded to end the fourth inning in the Wild Card Game. After that, the biggest outs are Betances in the fifth inning of the Wild Card Game and Betances in the sixth inning of ALDS Game Two, right? Middle of the order with a two-run lead? That’s huge. CPA covers the regular season and postseason. Everything a player does throughout the year either helps or hurts his team’s chances of winning the World Series. Betances was the primary eighth inning guy during the regular season and he racked up a lot of high-leverage outs. In the postseason, his role has changed a bit, in that he’s being asked to get the biggest outs regardless of inning. It’s pretty awesome. I love the way Boone has used Dellin so far. The last few years Betances saw his performance slip in the second half, particularly in September. Last year it was especially bad. I always kinda assumed at least part of it was fatigue. Betances was a multi-inning guy for a few years and that takes a toll on you. This year, there was no second half slip. Dellin remained effective all year, so much so that he’s now being asked to get the biggest outs in October. That’s a game-changer. It really is. He’s so good when right. As good as the bullpen was last season and last postseason, it was not as deep as this year’s bullpen. Joe Girardi leaned heavily on Robertson and Chapman last postseason, with Green and Tommy Kahnle filling in the gaps. This year Boone has Chapman in the ninth, Robertson and Britton as trusted late-inning guys, plus Green to fill in the gaps, plus Betances as what amounts to that middle of the order specialist. Girardi didn’t have this Betances last year. Thanks to built-in off-days, the Yankees are especially dangerous with their bullpen this postseason. Betances went two innings in the Wild Card Game and two innings in ALDS Game Two, then was able to rest during the off-day and be available for the next game. That doesn’t happen during the regular season. The presence of guys like Robertson and Britton allow Boone to be aggressive with Dellin in the middle innings, which he’s done so far this postseason, and Betances has responded by getting some of the biggest outs of the year already. It’s the polar opposite of last postseason.